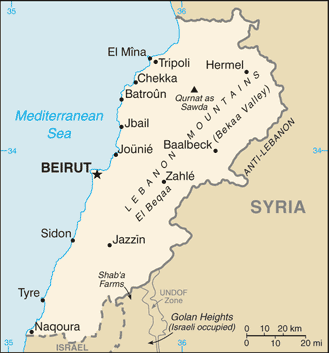 Lebanon : When and where to go? Beirut Airport is well served by various international airlines. A visa is required to enter the country; this can be obtained on your arrival and lasts for one month, it is renewable. The currency in circulation is the Lebanese Pound. The budget to plan for is a little higher than neighbouring countries: Plan for around €40 doe a reasonable double room and €15 for a good meal, much less if you eat in the local stalls. Concerning health precautions, follow the basic rules: No tap water, up to date vaccinations and anti-diarrhoea medication in your first aid kit. With relation to travel within the country, given the size of the country, collective taxis are a good idea; fairly cheap and they are frequent too. For your security, stay informed on the situation for certain areas of the country, especially around the border area with Israel.